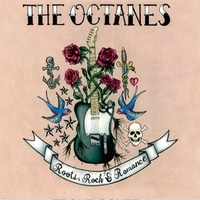 THE OCTANES "ROOTS , ROCK AND ROMANCE"
that will bring sweet relief. There aren't enough places in our Top 10s for all worthy music in Austin, so here's some run-off of my favorite moments of 2011, beginning with my Local Honorable Mention, Black Joe Lewis & the Honeybears' Scandalous . The title of this album pretty much says it all. From Hous­ton, Texas, the Octanes have clearly stud­ied their roots, infused it into their rock, and suc­cess­fully evoked the romance of musi­cal nos­tal­gia with their brand new self-released CD, Roots, Rock & Romance. This is roots rock at its indie finest and The Octanes explore many aspects of the genre across the 11 rockin’ cuts on this record. Songwriter/vocalist/lead gui­tarist Adam Burch­field explores a num­ber of facets with all orig­i­nal music and cre­ative arrange­ments. There’s rock, coun­try, rockabilly, Cajun zydeco, jump jive, and more here. Drum­mer Brian Shop­pell doesn’t just lay down a solid beat, he insists upon it and dri­ves the band with relent­less urgency toward the goal of mak­ing the lis­tener under­stand what the band is try­ing to say. Bassist Nick Gai­tan rides taste­fully in the pocket and com­pli­ments the drums so that they work together just the way they were meant to. Gaitan also served as Burchfield’s writ­ing part­ner on two of the CD’s songs includ­ing the absolutely infec­tious “Don’t Flip Your Lid.” That song also fea­tures some very, very clever gui­tar work on Burchfield’s part and great har­mony leads along with har­mony vocals. “Don’t Flip Your Lid” is a stand­out on the album because it’s jump/jive style is so out of place that it couldn’t fit more perfectly! The band is rounded out by Bart Mal­oney on pedal steel gui­tar. When the steel gui­tar is used prop­erly it’s one of my favorite sounds and Mal­oney knows how to use the instru­ment. He doesn’t over­play it like so many play­ers do and doesn’t try to steal the show, rather he adds sub­tle spice just where it’s needed and only steps out to the front when it’s appro­pri­ate. The per­fect exam­ple of both is his work on the song “Secret Hand­shake,” which closes the album. I love the way his steel gui­tar slides in and out of the album. It’s not always there in every verse of every song and that only serves to make it that much stronger when the band decides to bring it into the mix. Burch­field is a mon­ster on his tough-sounding Tele­caster and brings sev­eral play­ing styles to the record, includ­ing a very obvi­ous rock­a­billy influ­ence. He uses a tightly-compressed and over-driven sound, but its not overly dis­torted and so his lead lines and rhythm chunks are well-defined and mean­ing­ful and it allows him to show­case his great playing. Burchfield’s lead vocals are rough edged. Some­times it seems like he’s tee­ter­ing right on the edge of not prop­erly hit­ting the notes, but I’m not com­plain­ing! This style gives the songs an edge and the touch of gravel in his throat works per­fectly for this style in a way that a super-smooth, per­fectly toned voice just sim­ply never could. The songs on the CD explore a num­ber of dif­fer­ent themes, some seri­ous, some just fun and that pro­vides a good mix. The record hits some heavy tones like the back­room deals that make the rich richer while leav­ing the poor to sac­ri­fice them­selves as sol­diers or beg to keep their mea­ger fac­tory wages as described in the hard-hitting “Secret Hand­shake” and the despair of try­ing to make a livin’ in a mean world described by the tough “213” (one of my favorites on this record). Other songs hit per­sonal topics–the usual rela­tion­ship prob­lems as in the CDs strong one-two punch open­ers “Can’t Be Friends” and “Movin Up, Movin Out.” “Don’t Flip Your Lid” takes a bit lighter approach to rela­tion­ships and is just pure fun. And then there’s the care­free fun of “Louisiana Radio” which fea­tures very tasty accor­dion work by guest musi­cian, Ruben Moreno. I can hon­estly say that I don’t think there’s a week song on this record. I’ve already men­tioned a cou­ple that I con­sider my favorites, by they aren’t by far. There’s a lot to choose from here and the neat thing is that I’ll bet a lot of lis­ten­ers will pick other favorites than those that I’ve mentioned. But still, it’s not an ill-matched Franken­stein record by any means. It all holds together extremely well. The songs are well ordered and the CD is nicely paced, one lead­ing into the next with­out any of the jolt that comes when you lis­ten to songs that don’t go well together. In the #7 spot, “Where Were You?” slows things down for a com­fort­able five-and-a-half min­utes to let you catch your breath before the album fin­ishes out with four final rockers. The disc was recorded by Mark Shan­non at Bun­ga­low Stu­dio in Hous­ton, TX and the mix sounds great. Per­fect for the sound these guys were after. In short–and yes, I’ve saved the obvi­ous gag for the end of the review–this record is purely high octane! Check it out; you’ll be glad you did.